This exclusive and unique show for only 140 fans will be held at the Metropolis Studios in Chiswick London on Friday 3rd December 2010. This intimate show will be filmed for a DVD and shown on the ITV network as part of the a new series called Legends. The show will include a champagne reception photo opportunity with the band and an exclusive personal mention on the limited edition DVD. The show will last for 75 mins and will include songs from their 42 year repertoire and new material. The tickets are priced at £175 and will likely to be sold out very quickly. Details of where to buy the tickets will appear on this website very shortly. This is such exiting news!! Martin Davenport 9th September 2010. This entry was posted in News on September 9, 2010 by caravan. Can we buy more than 1 ticket i have 2 friends who will want to go great news any more dtaes next year??? Yes you can buy more than one ticket . There are no dates that have been agreed for next year. -yet. Whilst I would love to be a part of this the price is far too much for me to afford!! Hope the concert goes well and that a tour and new album follows – that would be fantastic!! Great news until i seen the price. Will do my best. Would love to see this gig. Absolutely brilliant news. I’ve sent for my ticket already. Just have to find a way of sneaking off work. Picks self up off floor…£175…Good Grief! No Way. While I’m disappointed that I can’t be at the Legends gig (due in part to my student budget and the fact that I’m busy on the 3rd) it’s great that the band’s still going strong! Good luck and to everyone lucky enough to get tickets enjoy yourselves! Again best of luck with the gig guys. It’ll be fantastic! In the scale of things £175 for a ticket which gets you studio VIP treatment meeting band members your name on a DVD cover etc. is very reasonable! Unfortunately I can’t get there because of a massive family pre-Christmas gathering “oop North” that weekend. I await 2011 tour details with relish! Decided it was just one of those things in life that had to be done. Couldn’t live with the regret of not doing it. So out with the Gold Card pushed a few buttons 2 tickets job done…..Regret Rien! Myself and my Good Lady will see you other 138 or so lucky devils on the 3rd Dec! Carpe Diem people! Carpe Diem! Great news about the recording Barclay James Harvest are also recording for this series the following night ! Wish I could afford to go for the weekend ! I really hope that the band do go on tour again please play Edinburgh if possible superb gig last time at the Liquid Rooms . 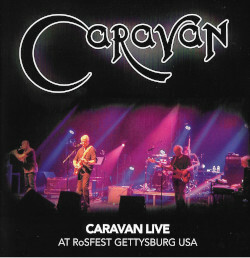 I went to University in Canterbury (from Northern Ireland )in the mid seventies because of Caravan ! This is great news but due to being late to the party I’ve already booked tickets for Weird Al Yankovic on the same night but if there’s a Nottingham or Canterbury gig planned then I’m there in a heartbeat so glad you guys are back and with new tunes too! !